After discovering a few months ago (after literally a lifetime of avoidance) that I’m not allergic to seeds I have been trying to eat them more often. This granola seemed an interesting addition to a breakfast repertoire which could do with a few more options. I have to confess that despite oats supposedly being so good for you and porridge being fashionable and all, I just don’t get on with porridge, it’s not my thing (well, certainly not at the moment!). So this was a way to add oats too. This recipe comes courtesy of Hugh Fearnley-Whittingstall whose recipe books I am very much enjoying at the moment. He has a way of making things seem approachable and I like that. It’s from River Cottage Light and Easy which is a book I’d actually put off buying for a while, thinking there would be nothing that appealed. This isn’t true but it took WHSmith having the book for only £6 (bargain!) for me to actually buy it. Mix 120g porridge oats, 40g chopped cashew nuts, 20g pumpkin seeds 20g sunflower seeds and a pinch of salt in a large bowl. Add 15g light olive oil and mix well. Add 50ml maple syrup and 25ml water with a tsp vanilla extract and mix again. Tip onto a parchment lined baking sheet and bake for about 40-50 minutes at 150C. Remove and allow to cool when it smells toasty and delicious. When cold store in an airtight container for apparently up to a month. I served mine with a chopped cox’s apple (so delicious at the moment) and some limited edition Yeo Valley spiced apple and quince yogurt (more new things to try!). 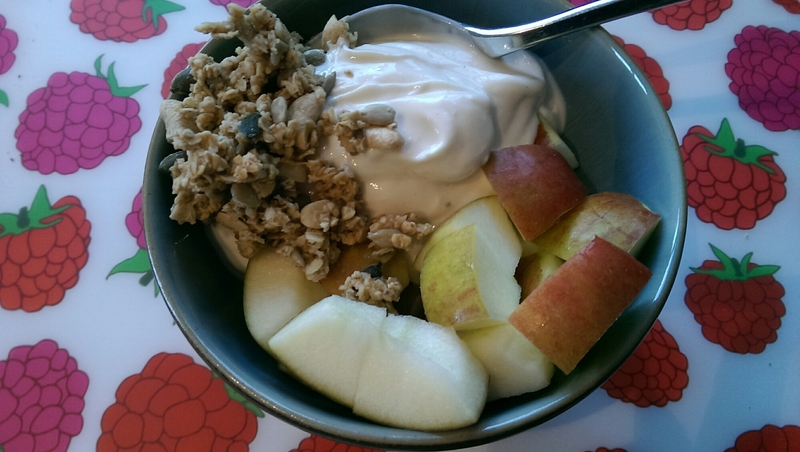 I really enjoyed the granola as an added texture and flavour in my breakfast. It wasn’t as crunchy as I’d thought but bear in mind I’ve never eaten commercial granola. The warm toasty oaty, nutty flavours were great. The yogurt was good too, I’d recommend it.